Our ultimate goal is to help advance human health globally. We are at the forefront of improving efficiency in the development of new medicines. 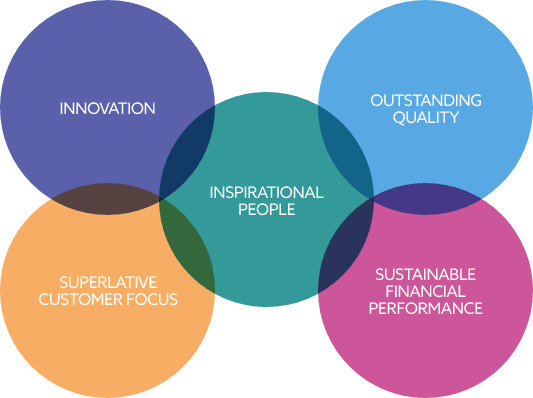 Our Core Values define Almac’s fundamental set of principles and beliefs. We are dedicated to solving important and challenging problems. We do this by promoting an environment where extending the boundaries of knowledge, technology, and creativity is encouraged. People are Almac’s core asset. Individually and collectively people are critical to the success of our vision. We recognize excellence and acknowledge that to empower our employees, we will continue to invest in their development. We are committed to understanding and fulfilling our customers’ needs and expectations. We build relationships based on integrity, responsiveness and excellent communication. As a client-focused, customer-service leader, we become a seamless extension of our industry partners. We ensure exceptional and reliable quality in all aspects of our work. We recognize that quality determines the extent of our success. Almac’s commitment to quality is guaranteed through a comprehensive range of standard operating procedures and fully documented quality systems developed in accordance with global pharmaceutical guidelines. We are committed to growing our EBITDA (Earnings Before Interest, Taxes, Depreciation and Amortization) and cash generation within the Group. By focusing on our strategic goals, Almac Group aim to achieve 1$ billion annual revenue by 2020. At Almac we take great pride in having established a culture that is built upon a unified set of values, competencies and core behaviors. We are committed to conducting our business in a way that exemplifies our culture and enables all of the Almac family to be proud of the work that they do, the company they work for, and the contribution that they make towards the advancement of human health. We are therefore proud to share the Almac Charter which details the exemplary way in which we do business. To understand what has driven Almac’s success and fostered a unique culture for its employees, you need to understand the man behind it all – Sir Allen McClay. Find out about this incredibly visionary entrepreneur by watching this video. Almac is proud of its charitable giving achievements, which bring potential benefits to many people and communities in Northern Ireland and further afield. We realize that charitable donations and funding community involvement as part of our Corporate Social Responsibility program brings a sense of achievement and pride in our workplace. There is no greater example of charitable giving than that of our late Founder and Chairman, Sir Allen McClay who established The McClay Foundation in 2008. To achieve its aims and purposes the Foundation works alone and with a number of partners including Northern Ireland Hospice, Buddy Bear Trust and Asha.